During a season of commemorating our loss of Pres. Kennedy, I had no patience with some of the programs which were put together, compiled, or thrown together without investing much time, research, or investment of the heart. Yet "Letters to Jackie: Remembering President Kennedy" touched me so deeply that I am posting my first IMDb review. 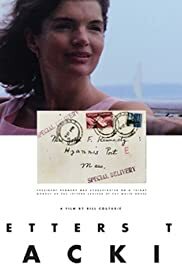 "Letters to Jackie" is a documentary about an event which was but a moment, but it cut deeply into history - a cut in the course of time which was (and must be) unforgettable. This TV special beautifully reveals the terrible sense of loss to individual Americans (and much of the world.) It is well done on various levels. The music is at times heartbreaking - and appropriately so. The production values are high but not glossy. I congratulate and thank the producers for this honest - not sensationalistic - presentation. The production is based upon a book collection of letters to the late President's wife. Contemporaneous photo images of letter writers take us back into time and to a place that may seem ancient to today's young; yet we who began to cry Nov. 22, 1963 did look like that when we were young. But that does not matter. Regardless of fashion style, half a century later many of us still easily weep at the memories, and we still ask the "What if's?" The featured letters, read by actors, reveal how personal the loss was. The assassination was Friday, and, by Monday, already over 40,000 people had mailed cards and letters to Mrs. Kennedy at the White House. By January 1964, the total exceeded 800,000 pieces of mail. These have been kept at the Kennedy Library and museum near Boston. It works. It's beautiful. It is worthy of those who picked up a pen or a crayon to write Mrs. Kennedy and the family. It's worth your time. And your tears.